I see the poppy fascists are out in force in Britain today. It is their Remembrance Day, when all good British wear the poppy to remember their war dead. Woe betide any person who casts aspersions on all the glorious military conflicts the British have been involved in. A huge vigilante group in the media and among war glorifiers watch carefully for any transgressions. It is the military version of political correctness gone mad. For weeks before they are gimlet eyed, seeking transgressors, ready to pounce. Two Irish soccer players this weekend were attacked for alleged poppy violations. Irish international footballer James McClean, whose family comes from Derry, had caused a firestorm last year when he made clear his opposition to celebrating the British Army and all its works based on what his family went through. This year his manager, Owen Coyle had to insist he was not dropped from the Wigan team for not wearing the poppy emblem, rather he was injured. Some were not buying that. Then Irish international Shane Long was accused of breaking the poppy code by not wearing a West Brom jersey with the poppy on it. He also denied it, saying that he merely changed jerseys and was given one without a poppy. The two incidents reveal that poppy fascism is alive and well, however. Last year targets were the Irish leader Enda Kenny and rugby legend Brian O’Driscoll who were attacked for not pinning on a poppy during visits to Britain. It is poppy fascism gone mad. John Snow, the distinguished British commentator, refuses to wear a poppy for that very reason, as he rails against the Poppy fanatics who regard not wearing one in honor of Britain’s war dead as close to treason. I’ll wear my own poppy when the British wear an Easter Lily remembering the Easter Rising of 1916 dead – that is it, pure and simple. The First World War for instance was a complete abomination, a blood filled massacre on a thousand battlefields that left millions dead and ravaged and led to the even bloodier Second World War conflict. Thirty seven million died including 8 million soldiers in the bloodiest war in history to that point – and we are supposed to celebrate that? Beside that, Patrick Pearse’s 1916 Rebellion with 446 killed was like a rounding error for the First World War casualties. On a point of principle I would not want to commemorate it, no more than I would the Vietnam War here which I regard as the closing kick of American paranoia about communism in Southeast Asia. Very few wars are just, as the churches and your common sense will tell you, and World War One, which has its origins in a series of utterly obscure events in the Balkans, will never be in that category. Of course there were brave men who fought in it and died, lions led by donkeys as the Ulster Volunteers called it, but that does not excuse its utter uselessness. 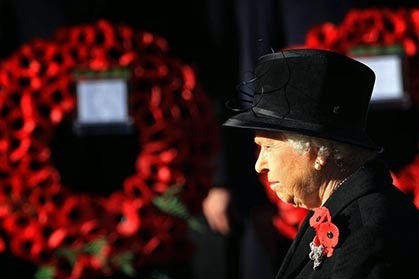 For any Irish leader to wear the poppy would be to ennoble that dreadful struggle where the upper class Brits sent millions of working-class men to their deaths. No way say I that it should be remembered and treated as some kind of antiseptic heroic deed from long ago. The men who died so needlessly would surely not want it so. So count me out poppy fascists - unless you wear the Easter Lily too.